The principle of the Cintec™ anchoring system is illustrated below. The stainless steel hollow section has been inserted into in situ materials in the drilled holes on either side of the cavity. The Cintec™ system comprises a steel section in a mesh fabric sleeve, into which a specially developed cementitious grout is injected under pressure. The flexible sleeve of woven polyester restrains the flow and expands to about twice its normal diameter, moulding itself into the shape and spaces within the walls, providing a mechanical bond. A hole is drilled in the structure which is the same size as the sock which is encasing the steel member. The anchor enclosed by the sock is dipped in water prior to inserting the anchor in the drilled hole to aid in the insertion process. The anchor is inflated with Presstec grout by way of an inflation tube which extends to the bottom on the anchor and 300 mm (12 inches) above the finished anchor. 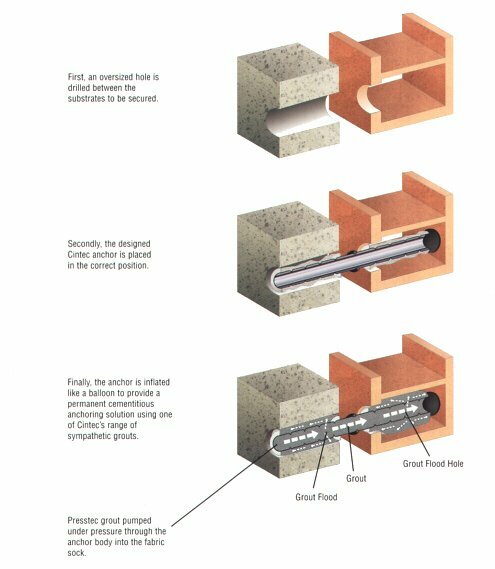 The grout is pumped under low pressure 30 to 45 psi through the inflation tube to control the grout flow and stop any probability of bursting the woven sock or creating a structural bulge. The anchor is inflated from the bottom in order to insure a proper inflation, displace air, and displace any water which might in the hole. If there is any water in the hole, the grout which is heavier than water will force the water to the surface. This process insures that the anchor conforms to all voids in the hole, this creates a mechanical bond that locks the anchor in place. This anchoring system dispenses with the need for unsightly patress plates on the exterior of the structure, creating an invisible mend. The inflated Cintec™ anchor is embedded one to 50 mm (2 inches) below the surface of the face material and end is filled with a patch to match the surface color. This gives an invisible repair, which traditional repair anchors cannot achieve. This product provides an effective solution for repairs to a variety of structures, damaged often as a result of earthquakes or general wear and tear. Moreover, the Cintec™ anchor is increasingly recognised as the minimal disruption answer for the upgrading of masonry arches, taking the strain of road haulage with progressively heavier axle loadings. The system has even been applied underwater, in harbour walls and foundations, demonstrating itself to be a versatile tool, resolving the multitude of technical challenges presented to it. Monuments, Churches and bridges have all benefited from its installation and today the patented anchoring system can be found in some of the world’s greatest structures from the Empire State Building in New York to the Christ Church Cathedral in New South Wales.